Wow–a Black Friday event I can certainly get my head around! Friday is known as “Black Friday” because most of the stores have big sales to attract the shoppers on the day after Thanksgiving. I thought about this and decided to do a QRP version. Here is the announcement. 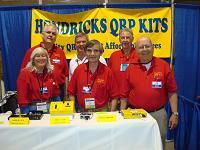 Check out what’s available at Hendricks QRP Kits! This entry was posted in Kits, News, QRP Radios, Websites and tagged Black Friday, Black Friday QRP, Hendricks QRP Kits. Bookmark the permalink.